Recently, Pope Francis spoke especially of the fraternal life as an indispensable element of witness to the true meaning of brotherhood in the world – especially in today’s world. “This fraternity, however, presupposes the fatherhood of God and the motherhood of the Church and of the Virgin Mary,” he said. “We must each day place ourselves once again in this relationship, and we can do so with prayer, the Eucharist, with adoration, with the Rosary.” Here at St. Paul, we have been given the privilege of offering Eucharistic Adoration on Wednesdays from 8 am to 9 pm and Fridays after the 7:30am Mass until Saturday before the 8:30am Mass. 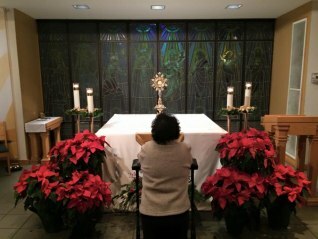 We have a core group of committed adorers who faithfully know that this is an important way to show devotion, gratitude, and adoration to the Real Presence of Christ in the Blessed Sacrament! We would like to include you in this beautiful ministry. Here at St.Paul, Adoration of the Blessed Sacrament is held each week on Wednesdays from 8:30 am to 9 pm and for 24 hours immediately following the Friday 7:30 a.m. Mass until the Saturday morning 8:30 a.m. Mass. We welcome all to participate in this beautiful devotion, as this is an important way to show gratitude and adoration to the Real Presence of Christ in the Blessed Sacrament! Come visit our Lord and grow in faith!